Can’t win em all. Right? 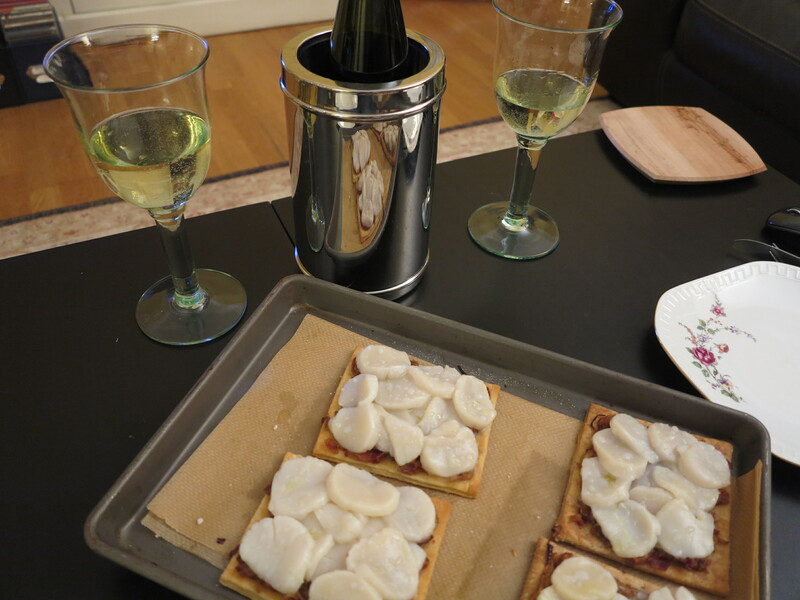 This week’s French Fridays with Dorie recipe, Scallop and Onion Tartes Fines, was a rather resounding miss in my house. Not sure why. I enjoy all of the ingredients separately and probably would have enjoyed them as caramelized onion tartes fines without the scallops, or as sauteed scallops without the tartes. But somehow they just didn’t work together for me. In fairness, we didn’t follow the recipe exactly. Dorie calls for the scallops to spend only a few minutes in the oven, just until warm. However, when I took the still raw scallops out of the oven after the appointed time, my husband expressed his rather strong objections to eating sushi for dinner. So back into the oven they went for a quick stint under the broiler. Not sure if they would have been better uncooked, but good food which nobody wants to eat isn’t helping anyone. On the plus side, the only ingredients which I had to buy for this recipe were the scallops and pancetta. It seems that since joining French Fridays with Dorie, I always have a package of puff pastry in freezer. Which got me thinking about the foods which Dorie has introduced into my life. Because she’s also the reason that I have cardamom pods in my spice drawer and pistachio oil in my fridge. None of these are things that I ever had in my kitchen before joining FFwD and are now kitchen staples. So, what about you? What has Dorie introduced to your kitchens? Anything that you couldn’t imagine doing without? I think that I would start going into withdrawal if my pistachio oil ran out. I have yet to get my hands on pistachio oil! 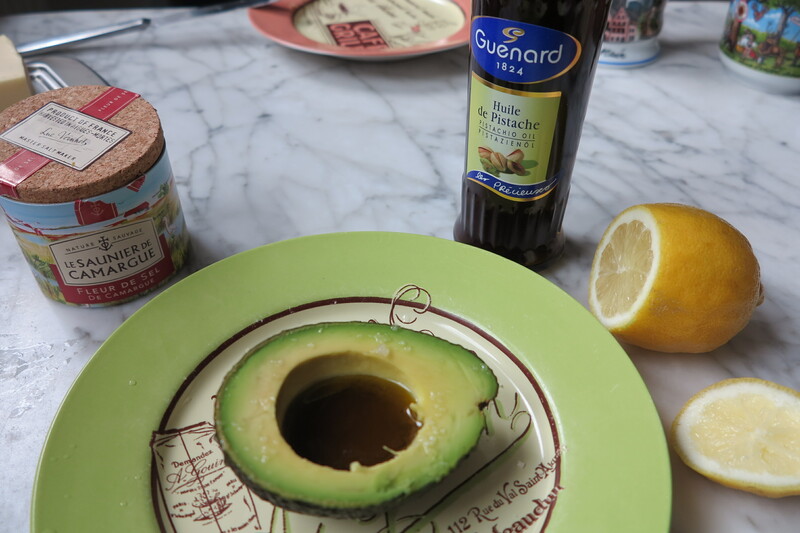 Filling an avocado with olive oil doesn’t have the same appeal, so of all the recipes I haven’t made up yet, that oil-filled avocado must be the easiest/silliest. Sorry your tarts were a miss. I used shrimp, because Charlie will eat them, and we all liked it. So true when I think about the types of things (puff pastry) I have on hand now and also the things I don’t think twice about making (choux pastry) which I never would have considered before. Sorry this was a miss for you – I seared my scallops since I knew I wouldn’t eat the raw scallops. We had the exact same reaction – not sure how this was such a miss when we like all the components…Have a lovely weekend! I liked this as is, but I think I would have liked them to have a little color just to minimize the “eww” factor visually. I too, always have puff pastry in my freezer, along with pistachio oil, Rose syrup and a variety of other things I would never have bought without FF’s. I left my tartes in the oven for about 5 minuets…I don’t do sushi either! However, we actually enjoyed them! Sorry they were a miss for you! Have a good weekend, Rose! My husband would have said the same thing had he seen the undercooked scallops! But since he refuses to eat them cooked or raw, it was a moot point! Yours look great…sorry they weren’t a hit. My go to everyday vinaigrette is sherry vinegar with almond oil from one of the salads we made three years ago, and they have become staples. I have tried to avoid “unitaskers” like the rose syrup and the elusive Espelette pepper. So sorry this didn’t work for you. I will say that though I liked it, I wouldn’t make it again, though I would make the puff pastry topped with the onions and bacon (and cheese, now that I’ve read Nana’s post). I can’t say that there are any ingredients that have taken up residence in my (bottomless) pantry since joining FFWD. However, I’ll give total credit to Dorie for teaching me that some of my favorite restaurant meals can be made at home. Seared scallops and duck breasts are at the very top of that list. Pistachio oil in the fridge, choux pastry puffs in the freezer, and white pepper in the pantry. I also add mustard to more things than I ever thought possible before I joined the group. I broiled my scallops for a bit, too. I think they’d have been better off properly seared and topping a salad on the side. I did not get to this recipe, though to be honest, I’m kind of ok with it, and happy that it was a reasonable choice (unlike other recipes I’ve missed!). I’m with you, while I always have had lots of things (my refrigerator is probably half condiments and another quarter things to drink) around, I do have plenty of additional items that I have on hand because of Dorie, and really have enjoyed – sometimes I really just want to look up more uses for them – agreed, the nut oils are fantastic. I love the new seasoning I have been introduced to.. when did we use truffle oil? I have a bottle of that which needs to be used up. I am with you – I like all the ingredients, including the scallops, but this combination just wasn’t right to me. Dorie has subtly invaded my psyche, my way of doing things, rather than introducing a new must have ingredient. Her all purpose pie dough is now my go to recipe. better than raw fish. Sorry they did not work for you. Rose, although you did not really enjoy these tartes fines much, they do look fabulous with all those slices of fresh, delicious, scallops! And I am a serious addict of pistachio oil as well – funny, I added a few drops to a wonderful dip for lunch before I read your post! LOL on the puff pastry. Filo dough in my freezer all the time because of Dorie and Donna Hay. I seared the scallops which sweetened them and made them better with the onions. Only wish I had gut mine square like you did. You have made me want to go out and buy pistachio oil. I recently purchased piment d’esplette, because I was tired of omitting it in all of Dorie’s recipes. I haven’t tried it yet, though….I’m sorry you didn’t like this one. Hopefully you’ll like the soup better!